The Diesel Driver shares with their insight into the latest fuel-economy regulations, as outlined by the U.S. Government. “The U.S. government unveiled new fuel-economy rules that will have a dramatic impact on Americans’ automotive purchasing habits. According to a joint statement released by the Environmental Protection Agency and Department of Transportation, cars for the 2016 model year will, on average, have to be 34% more efficient than current models, averaging 35.5 mpg (6.6 l/100 km). The standard for 2009 cars was 26.4 mpg (8.9 l/100 km). The gains are likely to come from incremental upgrades such as the use of more efficient tires, low-friction engine lubricants, and more efficient transmissions, as well as from the substitution of turbo-charged four- and six-cylinder motors for larger six- and eight-cylinder engines. While some car makers are introducing alternative fuel vehicles, including the Nissan Leaf electric car, which goes on sale in December, and the Chevrolet Volt, which will be available later this year. Mini has been offering the Mini E electric vehicle to a limited number of customers and the number of diesels available in the U.S. has increased dramatically. One automaker that has been offering cars with fuel-saving features is BMW, which brands its efforts as EfficientDynamics. 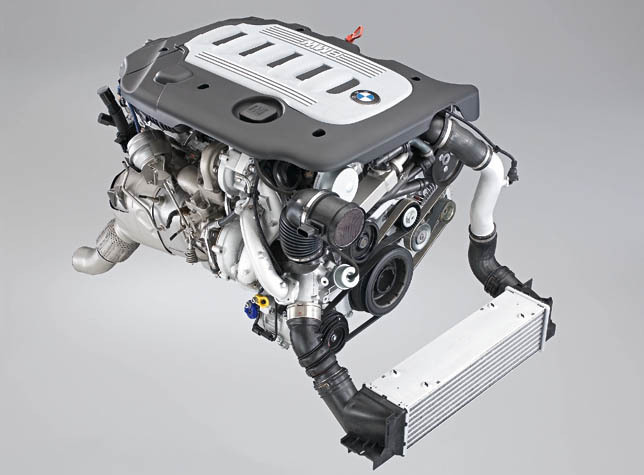 The BMW six-cylinder diesel engine with Variable Twin Turbo is representative of the use of more efficient motors. Available in the BMW 335d and X5 xDrive35d, the 3.0-liter engine offers 265 hp and an incredible 400 pound-feet of torque. The X5 gets 19 mpg (12.4 l/100 km) in the city and 26 mpg (9 l/100 km) on the highway.